Making engagement happen is the biggest business challenge most organisations will face this decade. It’s a surprisingly obvious, but nevertheless often overlooked truth: employee engagement and organisational performance go hand in hand. And in a crowded market place, the people are often what distinguish great organisations. As such, cultivating an engaged workforce should be at the core of every business strategy and a key objective for every leader and manager. We’ll take a close look at the engaged organisation, the correlation between employee engagement and company success, and lay-out six actionable strategies for increasing your employee engagement rates. What Does an Engaged Organisation Look Like? There’s no single characteristic of an engaged organisation, but rather a collection of traits – many of which are behavioral. It is frequently visible and can be a range of attributes or attitudes, that when added together, lift operational performance. It can be how people participate in meetings, how they interact with co-workers, how they respond to a customer, if they’re going the extra mile at critical junctures. Aon Hewitt, a well-respected human resources and consulting services company, defines engagement as “the psychological state and behavioral outcomes that lead to better performance.” The company categorises engagement outcomes as Say, Stay, and Strive. Say: Engaged employees have good things to say about the organisation when speaking with co-workers, potential employees, and customers. Stay: Engaged workers express a strong desire to be part of the organisation and enjoy an intense sense of belonging. Strive: Engaged team members are motivated and exert effort toward success in one’s job and for the company. 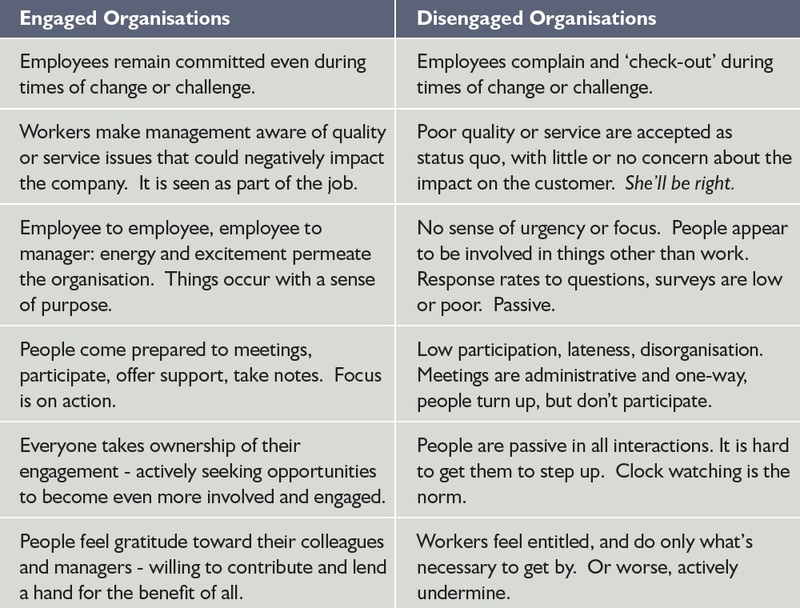 An analysis of engaged versus disengaged organisations brings to light these key differences. The importance of engagement as a medium for enabling employee productivity (and company success) can’t be overstated. Operating in a competitive global economy and with quickly-evolving technology, companies need employees to routinely go above and beyond. Simply ‘working harder’ is no longer enough – how employees respond to the myriad of challenges thrown at them becomes important. And engagement will offer that additional 1% that may distinguish the good from the ordinary. Time and again, research confirms what leaders of highly engaged companies already know – engaged employees are good for business. Companies with low engagement scores earn an operating income 32% lower than companies with more engaged employees. Similarly, companies with a highly engaged workforce experience a 19% growth in operating income over a 12-month period. Engagement also plays a critical role in determining rates of absenteeism, with absenteeism being 37% higher in organisations scoring in the bottom 25% on engagement. So, what can be done? Surveying your people’s feelings of engagement is the first step* (and the easy part) – the remedy and recovery is more challenging. What levers increase employee engagement and how can you incorporate these levers into your operating model? As expected, there’s no how-to guide for cultivating an engaged workforce; but, companies that are most successful at it tend to embrace similar philosophies, with collaboration, trust building, and promoting shared values at the heart of every decision. They also follow many of the same key managerial strategies – namely, those listed below. Make these straightforward and easy to implement engagement strategies part of your company’s standard operating rhythm and you’ll be rewarded with a happier, more productive workforce. Gallup research indicates that among all the aspects of an employee’s job, understanding what’s expected is possibly the most basic employee need5. As such, Gallup named clarity of expectations as the “First Element of Great Managing”. Simply put, engagement can’t happen without clarity. If you don’t know where you are going, how do you know how to get there? What to do: Don’t count on job descriptions to provide the detail employees need about their responsibilities, and don’t limit discussions about expectations to their yearly review. Talk to your team members regularly, setting a routine of how you set expectations of what is to be done. This should not be ad hoc or ‘as needed’; set an operating rhythm of when and how you talk with your people about what is expected – in terms of quality, delivery expectations and effort. Seek understanding and alignment by asking open-ended questions that can help clarify expectations. Periodically review their responsibilities with them and check in on progress across the day and week regarding specific activities, projects and goals. Members About Life On and Off the Job Studies suggest that employees who believe their manager is invested in them – not only as workers, but also as people – are more likely to be engaged. This isn’t surprising news, yet many managers hesitate to really get to know their employees. They limit conversations to the task at hand, and in doing so miss an important engagement opportunity. What to do: The best managers don’t rely solely on email or messaging. They check-in with their team members through face-to-face interactions, where they can make a more personal connection, assess body language, and build a foundation of trust. If done as a routine – that everyone expects and can plan for – then a manager is presented with a consistent and frequent opportunity to demonstrate how much they care for their people and their performance. It is getting the balance right between chatting aimlessly and focusing on what you as a manager can do to help them succeed at work. Routine check ins provide the opportunity to understand and appreciate the unique challenges each faces not only in, but also outside of the office. With this information, you’re better able to accommodate their individuality in a way that boosts performance and engagement. Remember, no one cares how much you know, until they know how much you care. One of the most powerful ways to improve engagement is to place employees in jobs that capitalise on their natural talents, while offering opportunities for personal growth. What’s more, one sure way to disengage staff is to let them feel underused. In fact, there’s evidence that managers who help employees grow and develop through their strengths are more than two times as likely to engage their team members. What to do: Showing that you care about employee job satisfaction can have an incredibly positive impact on engagement. So, talk openly and frankly with your people. Does their current role make full use of their strengths and abilities? What is your view on their current performance and what can you do to enhance that? Is their career moving in the direction they desire? If not, devise a plan to expand and/or modify their role. Discuss training and development opportunities that can help them advance, and provide clear, consistent, and honest feedback on their performance. Without signs that their efforts are meaningful and contribute to organisational success, employees can become distant, and ultimately, actively disengaged. On the other hand, those who feel they’re making an important contribution tend to take more pride in the results of their efforts – which is an indication they’re engaged. Moreover, when employees join leaders in owning responsibility for business success, teamwork blossoms. What to do: It’s crucial to remind your employees of their importance and reinforce the fact that their job performance impacts the organisation as a whole. Help them see the direct connection between their activities and how they contribute to the commitments made to customers and ultimately the company’s success. Feedback on what has been done well, and what needs to change or improve provides a clear path for people to understand their role and their contribution. When done regularly and as part of the daily work routine, it becomes a conversation that enables people to significantly lift and sustain their performance. Whenever possible provide measurable examples – show them how even the smallest tasks can contribute. Workplace recognition may be one of the most underused strategies for increasing employee engagement. Not only does recognition make employees feel proud of – and valued for – their work (both of which can lead to higher engagement rates), it also sends a message to others about what success looks like in your company. What’s more, people who feel they aren’t adequately recognised are two times as likely to say they’ll leave their job within the year. However, it’s not just about ‘pumping up everyone’s tyres’; it must be authentic and based on actual performance data or recognisable behaviours. And finding a balance between team and individual performance is critical. A high performing team contributes more significantly than a group working as individuals. What to do: Regularly and routinely acknowledge actual performance. It is everything from thanking an individual for a specific effort or job well done through to a team hitting its targets in difficult circumstances. Be specific and do it in a timely manner. Use data to help contextualise the performance; what was actually achieved versus plan or historical performance. Talk about what specific behaviours contributed; they should be grounded in the desired operating model of the organisation and the area. Focus it on the impact on colleagues and customers; how did this support our commitments as an organisation (this links back to the first point of setting a clear direction)? Have others (customers or senior leaders) come to the area to recognise efforts; it demonstrates the impact on others outside of the area, connecting people in a real way to the organisation’s mission. And a bit of celebration also works. But use it wisely; what works today is not necessarily enough tomorrow. And rewards for no effort devalue any attempt to reward true effort. Culture Over a High-Pressured One As a leader, you set the standard for your company’s culture. Your attitude and actions trickle down to your managers, front-line staff, and ultimately to your customers. In the end, establishing a cut-throat, highpressure company culture is bound to backfire. For instance, health care costs at high-pressure organisations are nearly 50% greater than at other organisations. Conversely, studies show that positive organisational psychology leads to a wealth of benefits – increased employee engagement being one of them. Establish an operating rhythm that sets the tone for how you expect your people to work. It should be a calm, rhythmic beat, that makes it easy for people to step up and do their jobs. Firefighting, hero-mentality work environments are chaos and debilitating. What to do: A positive and healthy company culture is founded on principles such as mutual respect, avoiding blame, and kindness and compassion. This is underpinned and enabled by an operation that is organised and has a manager that is in control and visibly engaging with and supporting their people. It is the captain on the field, directing their team. It is the leader setting an example about how to plan and manage their work. It is the visionary leader setting tough but achievable goals; and then working in the trenches to help make it happen. It is a culture that sets high performance targets and everyone owns them – and feels safe to do so. And it strikes the right balance between work and social. Each organisation sets its tone about ‘fun’ stuff. Ultimately, culture is ‘this is how we do things around here’; an engaged culture is one where everyone can articulate what that looks like, with passion. As with any change you want to make in your organisation, knowing where to start can be the biggest challenge. Increasing employee engagement is no exception, and it doesn’t happen overnight; it is the outcome of doing a lot of things right. Employee engagement must be one of your company’s purposeful goals, a conscious continual effort that’s frequently assessed and fine-tuned. 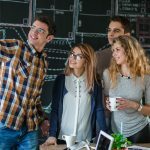 Best employer companies display significantly stronger cultures than average companies, marked by strong leadership, reputation, performance orientation, and employee engagement. 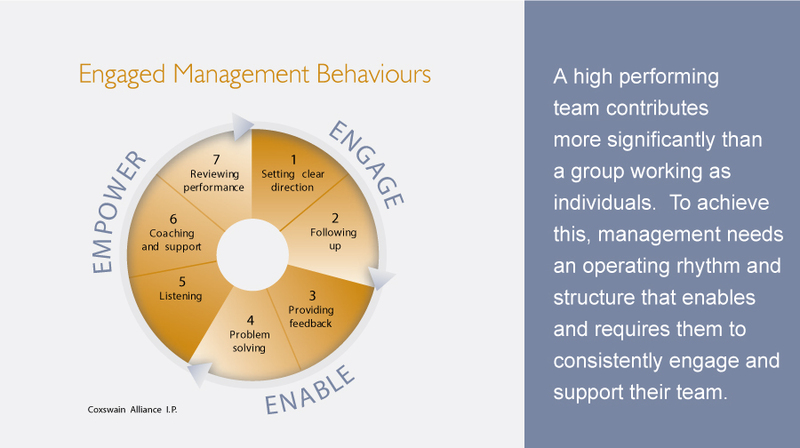 And a core enabler of employee engagement is having management present and relevant in their teams. Working hard to make their team a success. It is a set of behavioural practices that engage, enable and empower people.